Harvard Business School Press, 9781633693951, 256pp. Artificial intelligence, big data, modern science, and the internet are all revealing a fundamental truth: The world is vastly more complex and unpredictable than we've allowed ourselves to see. 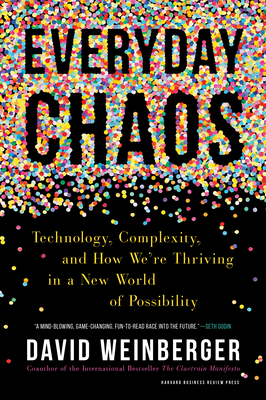 Now that technology is enabling us to take advantage of all the chaos it's revealing, our understanding of how things happen is changing--and with it our deepest strategies for predicting, preparing for, and managing our world. This affects everything, from how we approach our everyday lives to how we make moral decisions and how we run our businesses. Take machine learning, which makes better predictions about weather, medical diagnoses, and product performance than we do--but often does so at the expense of our understanding of how it arrived at those predictions. While this can be dangerous, accepting it is also liberating, for it enables us to harness the complexity of an immense amount of data around us. We are also turning to strategies that avoid anticipating the future altogether, such as A/B testing, Minimum Viable Products, open platforms, and user-modifiable video games. We even take for granted that a simple hashtag can organize unplanned, leaderless movements such as #MeToo. Through stories from history, business, and technology, philosopher and technologist David Weinberger finds the unifying truths lying below the surface of the tools we take for granted--and a future in which our best strategy often requires holding back from anticipating and instead creating as many possibilities as we can. The book's imperative for business and beyond is simple: Make. More. Future. The result is a world no longer focused on limitations but optimized for possibilities. From the earliest days of the web, David Weinberger has been a pioneering thought leader about the internet's effect on our lives, on our businesses, and most of all on our ideas. He has contributed to areas ranging from marketing and libraries to politics and journalism as a strategic marketing VP and consultant, an internet adviser to presidential campaigns, an early social-networking entrepreneur, a writer-in-residence at Google, a senior researcher at Harvard's Berkman Klein Center for Internet & Society, a fellow at Harvard's Shorenstein Center on Media, Politics and Public Policy, a Franklin Fellow at the US State Department, and a philosophy professor. His writing has appeared in publications from Wired to Harvard Business Review, and his books include the bestselling The Cluetrain Manifesto.